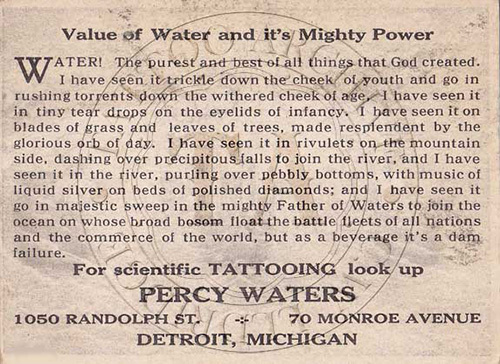 Percy Waters, born in 1888 in Anniston Alabama, was one of the great names in tattooing. The story goes that as a kid, Waters would hang out around the show folks that came to his town and at times these folks gave him odd jobs to do around the lot. The tattooists who worked these traveling shows befriended Waters. It was here the Percy Waters began to learn the art of tattooing. He started tattooing as a hobby not knowing if it would be a career for him. 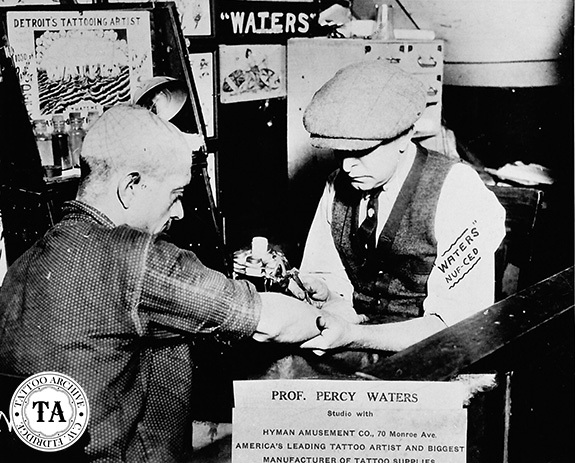 In the early 1900s as his interest grew in tattooing, Percy Waters would travel to New York City to work and learn from tattooists there. This hobby tattooing got him into trouble in 1917 when he tattooed the daughter of a wealthy local and was told to get out of town or else! After a bit of traveling around, Waters settled in Detroit, Michigan and for the next two decades Percy Waters put Detroit on the tattoo map. He first set up shop near Electric Park, a massive amusement park, but within a few years he moved downtown to Monroe & Randolph Streets where he ran two tattoo shops doing some of the best tattooing of the era. Percy Waters also established a supply business and sold his wares around the world. In 1929 he patented an electric tattooing machine that became the standard for the industry. After decades in Detroit, Waters returned to his beloved hometown of Anniston Alabama and continued in the tattoo and supply business until his death in 1952. Enclosed with this article is one of our favorite business cards from Waters. This card was hand-drawn and on the front is his name Waters rendered in big block letters surrounded by a raging sea. The back of this card had a spiel about the value of water and it's mighty power. I think this card speaks volumes about Percy Waters' scene of humor. The other image with this article shows Percy Waters working from his tattoo trunk. 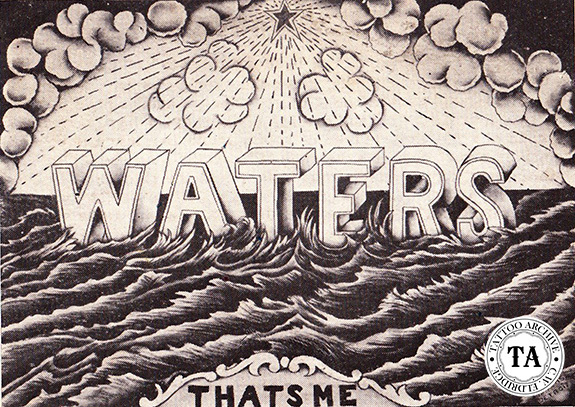 On the top of the trunk is probably the original artwork for this Waters' card. The sticker on the photograph shows the Prof. at the Hyman Amusement Co. at #70 Monroe Avenue in Detroit. This was an arcade that Waters worked at for many years.